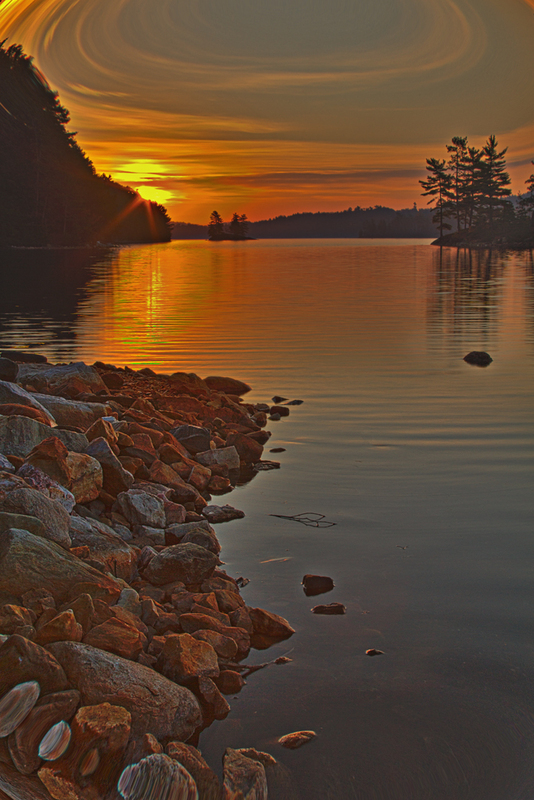 This is a very interesting composition that I was able to capture on my last trip into OSA Lake in Killarney Provincial Park.The shore line had a colorful collection of rocks of various sizes and shapes.I just needed something to go with it.As you spend time in various locals you will discover locations that could produce a good shot.They just need something to complete the composition. It is a matter of waiting and as you can see from the photo above it is sunrise.So with the sun coming up and the rocky shore line in the foreground I was able to complete the scene.The early morning light gives the rocks the warm colors and the golden reflections tie in the photo front to back.As I said previously I keep these various locations in the back of my mind and return time and again till I get what I want.You will also note that there is an interesting cloud pattern that developed as I took this photo. The shot was taken with a shutter speed of 1/10 sec @ f22.I set up my tripod and Canon 7d and just waited for the right moment before taken a number of exposures. Well that is it for this post.So until next time happy trails. Is this lake near the top of a mountain? There appears to be a large shield cloud directly in front of you, creating a large halo neatly inscribed in the frame. Is that what’s happening, or is it something else? Anyway, it’s an extremely unusual photo, from that regard. Greg this lake is surrounded by the La Cloche Mountains.This also a long exposure taken at dawn.